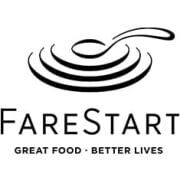 FareStart offers life skills and training programs to people experiencing poverty and homelessness through 4 local programs: Adult Culinary, Youth Culinary, Youth Barista, and a Food Service Apprenticeship Program. We are looking for volunteers to help support our catering operations working alongside FareStart chefs and Adult Culinary students. Shifts are 10 AM - 2 PM/M-F and we are looking for volunteers who can commit to a once or twice a week schedule. Experience in a kitchen is great, but not required. We do require a food handlers permit, but can support you in getting one (reimbursement).